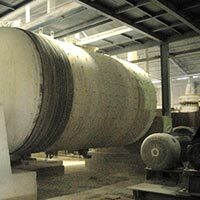 Generally the composistion of the raw material is white fired ball clay(ukraine ball clay) imported from Russia, quartz of 99% Silica, Potash feldspar of 12% to 14% Alkalies, Soda feldspar of 12% to 14% alkalies,strengthening agent,china clay, body stains imported from Itaca Spain. We are having total 6 Ball Mills, so the daily production of slurry is more than 300 tons. 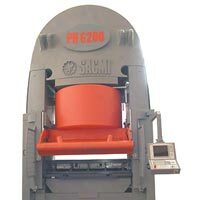 The Sacmi Kiln is imported from Spain of 185 metre lenth with working area of 2.65 metre. The main function of the Press is to give the shape of tile from the granules. Polishing machine makes the tiles completely surface flat with glossines of greater than 75 gloss value. 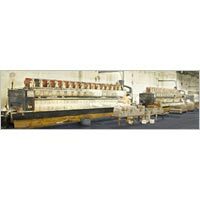 The machine consists of pre squaring machine, calibrating machine of 12 heads to make the surface completely flat, than passes to the polishing heads consisting of 38 polishing heads to give the glossiness. Step by step reaching final 75 gloss value, the tile than passes to final squaring & champering machine to give the perfect squared tile with jointless laying. The machine is imported from Kexinda China consisting of pre squaring machine, calibrating machine consisting of 12 heads, 38 polishing heads, final squaring machine. 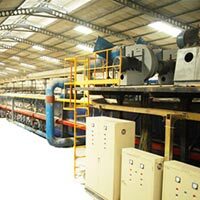 The production of the machine is greater than 9500 m2 per day. The tile is compacted using ph 6200 hydraulic press with a specific pressure of 360 kg/cm2. The green tile is passed through a 5 layer horizontal to remove the residual moisture uniformly & also to give dry strength so the tile is able to move in the glazing line. The press is ph 6200 Sacmi Press imported from Spain and the no of cavity is 3 tiles.the press cycle is 6 cycle/min i.e 9500 m2 per day.